We here at Keller Williams Realty - Palm Springs - Team Michael have built a professional team of Realtors that are ready, willing and able to help buyers, sellers, Real Estate Referral Partners achieve their goals. We have over 40 years in the Real Estate industry. We are one of the top producing Teams in the Palm Springs area, ranking in the top 25 Teams in Keller Williams International. Our Team Leader Michael founded Keller Williams Realty in the Coachella Valley in 2003 currently with 4 offices, 550 agents and most recently opened a new Keller Williams Realty in Redlands, CA. He is currently on the Board of Governors of the Keller Williams Luxury Homes International, helping develop the acclaimed Luxury Homes Division International. Leased land common to the Palm Springs area, is unusual to areas outside Coachella valley and does not translate to websites like Realtor.com or Zillow. This is a major benefit of our Palm Springs specifiic website, which includes criteria found only in Palm Springs! Certified Residential Specialist (CRS) Designation - CRS is the highest credential awarded to residential sales agents, managers and brokers. Certified Real Estate Brokerage Manager (CRB) Designation - This designation represents the highest level of professional achievement in real estate brokerage management. Graduate, REALTOR® Institute (GRI) designation - GRI is the mark of a real estate professional who has made the commitment to provide a high level of professional services by securing a strong educational foundation. Keller Williams Luxury International - Keller Williams Luxury International is an exclusive, elite and sophisticated group of real estate consultants who absolutely raise the bar for service in the upper-tier home market. 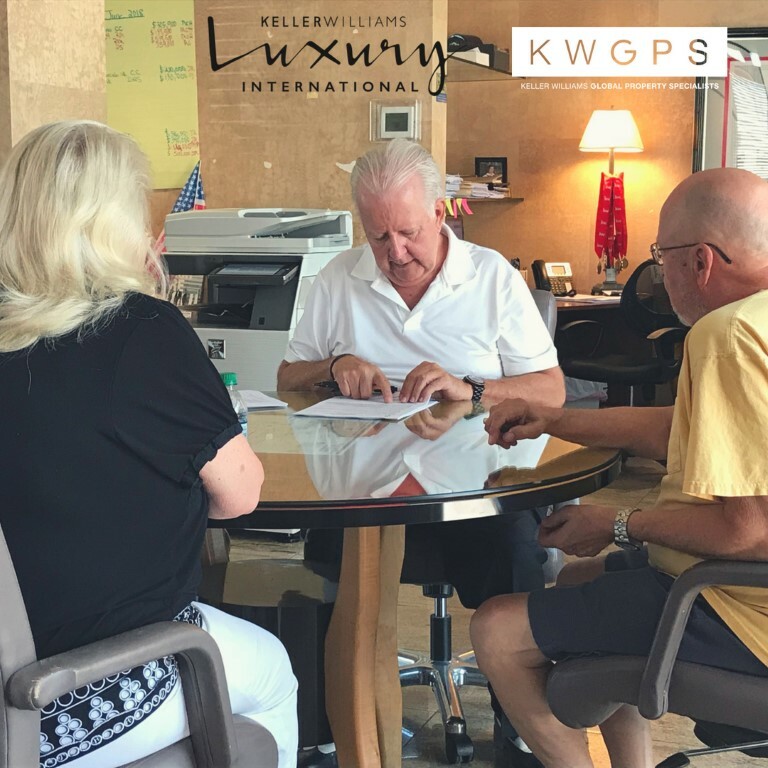 Our Keller Williams Luxury Consultants must meet certain qualifications to join our network -- and each of them has a proven track record of delivering unparalleled service to their clients. Certified International Property Specialist Designation (CIPS) and Global Property Specialist (GPS)- CIPS and GPS designation means the REALTOR® has specialized in the international marketplace.
" Diana was fabulous to work with. She went above and beyond what was required. If I ever sell my property she would be the first one I would call. " " We met her at an open house. The property didn't interest us, but Alison did. She proved to be as good for us as we thought she would be. For example, she was the only realtor who seemed to value all the improvements we made on our condo (we ended up with multiple offers at or above asking price, which based on comps was optimistic to begin with). On the buy side, she listened and showed us properties that reflected our wish list. On both the buy side and the sell side, she was with us every step of the way. " " Dear Blaire, Thank you so much for all your hard work to make this home purchase in Palm Desert go so smoothly. You were so amazingly responsive to our every need, even while you were on vacation! It was a pleasure working with you. I would highly recommend you to anyone looking for a house in the area! Thank you again! !” "
- Dan & Leah M.
" Dear Pete, Thank you for your continued friendship, along with your helpful, and most professional real estate guidance a few months back. Moving from San Diego to Palm Desert was a difficult process (especially alone) but it was so much less difficult with your being so knowledgeable and professional in all areas of real estate and the area here! It meant a lot to me, that an otherwise difficult process could be so much easier with your knowledge and skill, plus a sincere desire to meet my needs. Your ability to explore all areas throughout this beautiful Coachella Valley also made it FUN. The entire process was a true education and most professional. I can honestly give my highest recommendations for your guidance. Thank you again!!! Sincerely, Sherry Hughes "
" Working with Michael Hilgenberg and his team at Keller Williams was a dream. Michael knows the Desert market and guided me well through all my questions and concerns. He made sure that only qualified buyers were shown the property and I was always given advance notice regarding showings. I felt completely secure that I was in the hands of knowledgeable real estate professionals who had my best interest at heart and I was never disappointed. Selling my home was a smooth, non-complicated experience and I would work with Michael Hilgenberg and his team again and again. " " Blaire is an outstanding realtor! I would recommend her to anyone. She was very easy to work with. She was not pushy, let us take our time with looking at houses, and very knowledgeable. She listened to what we were looking for in a house and had a new list of houses to check out almost every day. She was very quick to respond whether it was by email, phone, or text and was available all hours of the day. Being a first time home buyer, she was honest with us and walked us through each step of the process. I would definitely work with her again and would recommend her to anyone! " - Josh & Athena H.
" Dear Michael, When I first met you I though ” What a classy smart guy”. Since then I realized not only is he a classy dresser; but a very genuine great guy! It has been a pleasure to work with you, and feel I have found a great friend. I can’t thank you enough for your sincere and kind gestures in wanting to help me in every way. Thank you so much! " " I had plumbing, electrical problems and several maintenance issues the very first evening in the condo. I called Dianna immediately, crying and very upset. She Responded with “I’ll be right over.” I couldn’t even call the owner while feeling so vulnerable and angry. Dianna reassured me that she would call the owner “I do not want you to worry. You are my client and this is unacceptable.” "
" As a senior mortgage banker for Franklin Loan Center, it is always refreshing to work with an agent that is reliable, understands the buying/selling and lending process as well as has a strong knowledge of the current market conditions. Blaire’s ability to go the extra mile made this deal close. She was great to work with and I look forward to working with her again. " " John and Tom did a great job to get the deal done, we are out of town customers and they always did their best to keep us informed. " " She came all the way over to the house to take the lock box off for me. I will never forget her kindness. " " Diana is kind, respectful, honest and genuine. She’s very helpful and sincere. " " Eve is an awesome agent. We were very happy with her work ethic. She treated us like we were her only client for the duration of our dealings. I would recommend her without hesitation to any of my family, neighbors or friends. She went above and beyond, in our circumstance, to make the deal go through. She has very good negotiating skills, and has a heart felt connection with people. Thanks Eve!! " Here at Team Michael Keller Williams Realty (CalDRE#00938044), it is our goal, each and every day, to provide an always unparalleled level of service to our real estate clients by pulling together the experience, skills, talents and resources of professionals who enjoy their business and who genuinely care about the interests and real estate objectives of those who employ our services. We have been serving the Coachella Valley and it's beautiful cities such as Palm Springs, Rancho Mirage, Indian Wells, Indio, Coachella, La Quinta and more since 1986. Whether you are looking to buy, sell, or invest in Real Estate, give Team Michael a call. We get the job done right the 1st time!